If you’re missing a tooth, Dr. Novak can help you fill the gap in your smile with a permanent bridge. Once in place, you can look forward to both restored appearance and health. What’s more, with an implant-supported bridge, you can enjoy full functionality again. A traditional bridge attaches to one or more supporting dental crowns, but an implant-supported bridge attaches directly to the jaw with a durable titanium post that acts like a prosthetic tooth root. During a consultation appointment, Dr. Novak can help you decide which option is right for you. When one or more teeth are missing, nearby teeth can change position, leading to a range of problems that include the loss of more teeth. 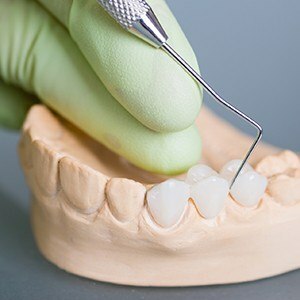 A fixed bridge will stabilize your bite and prevent teeth from moving out alignment while an implant-supported bridge will also support and strengthen your jawbone. If you think a bridge would be right for your smile, call our Weatherford office so we can discuss the specifics with you. A full, healthy smile is possible!